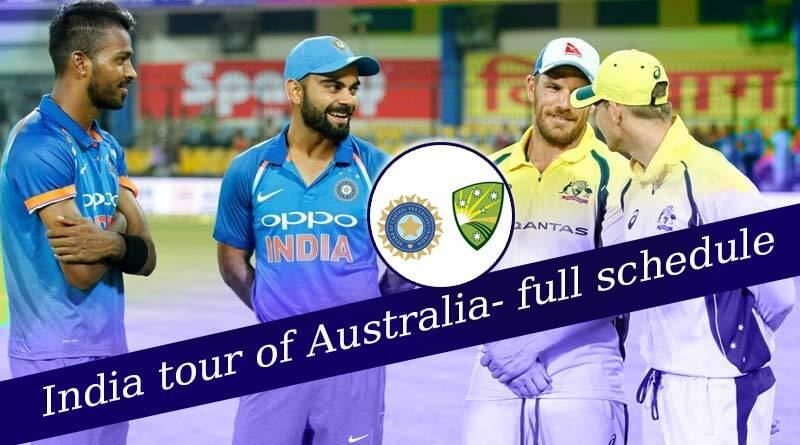 Less than a week later, India will commence a grueling tour of Australia, one that will see them play series in all formats. The 2-month long tour will see the Indian cricket team play 3 T20Is, 4 Tests and 3 ODIs with the first match of the tour scheduled to take place on November 21. The first Test begins on December 6 while the first ODI will take place on January 12. The first T20 will be played at 2:30 pm IST with the following two taking place at 1:30 pm IST. The test series will require cricket lovers to set their alarms early with the third and fourth match kick starting as early as 5:00 am IST. The Sony network has the rights of all Indian matches played on foreign soil and India Vs Australia will be aired on Sony Ten 1/HD and Sony Six. The BCCI has already announced the test and T20 squads with MS Dhoni missing out on a spot in the 20 over format. giving way for Rishabh Pant with an eye on strengthening the batsman wicket-keeper role. Rohit Sharma and Murali Vijay have been recalled for the test series given their strong showing in recent matches. The Australians have meanwhile only released their T20 squad.